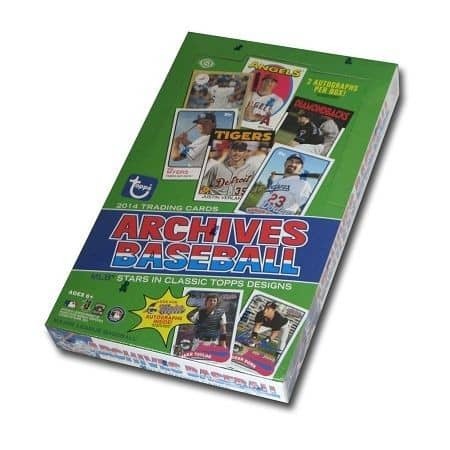 Factory Sealed 2014 Topps Archives Baseball Hobby Box mit 24 Packs a 8 Cards per Pack. 2 On-Card Autogramme per Box !!! Produktinformationen "2014 Topps Archives Baseball Hobby Box MLB"
Look for Masahiro Tanaka Rookie Cards! Topps Archives Baseball is bringing you back in time. The beloved designs and inserts from the ,70s, ,80s and ,90s will be showcased featuring a combination of current stars, retired legends, and Fan Favorites. The Fan Favorites Autographs will also feature current stars and retired legends for the 1st time in 2014, in addition to famous names from the past. Finally, there will be insert cards and autographed cards to celebrate the 25th anniversary of the classic baseball movie, Major League. - Fan Favorites Autographs Purple Parallel #'d to 10 NEW! - Fan Favorites Autographs Sapphire Parallel #'d to 5 NEW! - Fan Favorites Autographs Printing Plates #'d 1/1 NEW! Stars will sign copies of a vintage card. Cards will be sequentially numbered to 10 and include a Topps Originals foil-stamped logo. Hobby Only. Celebrating the 25th anniversary of the movie. NEW! - Major League "Worst to First" Parallel Autographs #'d to 10. Firebrand die-cut design, using a combination of present and retired players. NEW! Hobby Only! Modeled after the Topps 1969 Deckle design. - Autographs #'d to 25. Modeled after the 1987 Topps All-Star subset. - Autographs #'d to 5 or less. - Autographs #'d to 10 or less. NEW! Featuring Retired Stars, Veterans and Top Rookies. - Archives Silver #'d to 99 NEW! Weiterführende Links zu "2014 Topps Archives Baseball Hobby Box MLB"
Fanbewertungen für "2014 Topps Archives Baseball Hobby Box MLB"